Sambal Ijo/Sambal Lado Mudo or green chillies sambal is a typical sambal from Padang, West Sumatra. If you ever go to Padang or Minang restaurant, you will find it as one of their main menu. This sambal is a ‘necessary’ part of the menu as the accompaniment for all the dishes. When I lived in Indonesia, it was easy to get. Here I have to make it by myself. Luckily I have chillies growing in my garden. One of them shaped like a ball … it’s quite different than chillies I had in Indonesia. I got it from my Macedonian neighbour. And this year I finally got enough stock of chillies until next summer. And I decided to make Sambal Ijo from those green ball chillies to see how strong they are. 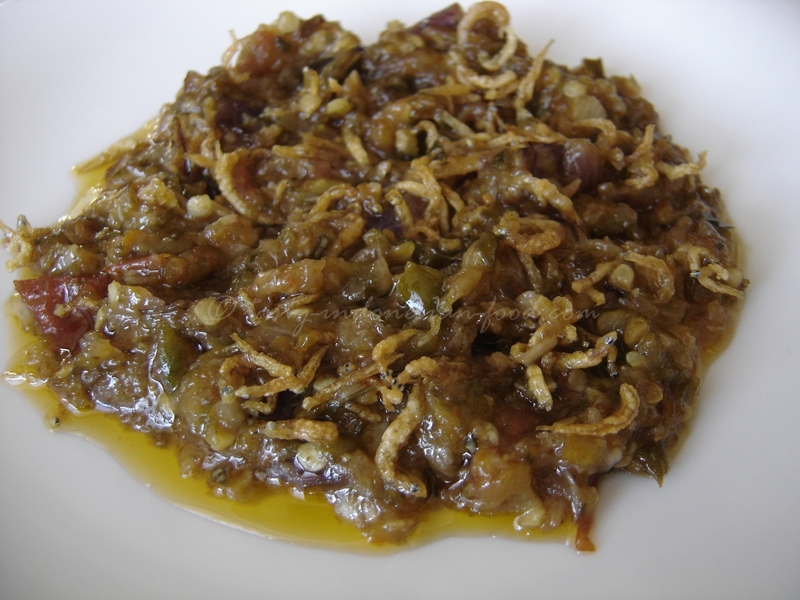 I added Medan dried Anchovies (Teri Medan) to get richer taste. 1. Heat the oil and fry the anchovies. Set aside. 3. Then grind into roughly paste (tumbuk kasar), and bring back to fry for few minutes. Add the lime juice and the fried anchovies. 4. Serving suggestion: best to eat with nasi putih (plain rice) and Rendang or Chicken Curry (Kare Ayam).